"One would think that a biography of an economist would make almost as dull a read as a book on economics. This volume tells a story well in an easy prose while passively challenging the reader with deep ideas on almost every page." Jesse Norman takes on the unenviable task of writing a biography of a person whose work became an enormously complex set of ideals. Adam Smith became "an eloquent advocate of the freedom" to some but to others an "apologist for wealth and inequality and human selfishness." How do you relate the real human being to "the most influential economist who has ever lived"? The "influence" of his ideas "spanning philosophy, politics and sociology" are "so intellectually fertile, so multi-faceted and so quotable" to have encouraged "political leaders of every stripe" to "enlist him as a supporter" and to offer "constant temptations to over-interpretation or outright misappropriation." Adam Smith begins with the monumental scale of the subject as cause and concept. This book strives to find "what Smith did in fact think" and "why what he thought still profoundly matters." 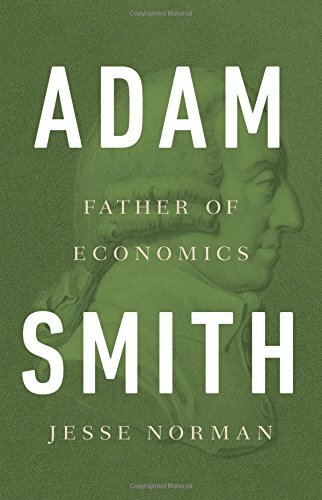 Smith counted his contemporary intellectual giants David Hume and Edmund Burke as friends but he "lives and breathes today though his ideas and his impact." He pioneered ideas of the common points of philosophy and science, as well as pioneering the acquisition of knowledge as separate from learning the greater system of learning. Smith's achievements owed much to his father, a Comptroller of Customs "whose income depended largely on fees from trade" in Kirkcaldy, where "the local economy was in relative decline" due to changes in Scotland's international trade than to bring kidnapped by Gypsies as a child. Adam Senior "kept a liberal-minded household, with a library of some eighty books." A dying Adam Smith Senior did not live to know his son but in his will made every effort to see to his child's future. The Smiths had little money, but Adam Junior had a mother who "lavished love and attention." The young Smith lived within a community and family of influence. At one of the best of Scotland's "boroughs or private schools," he obtained a classical education but with acknowledgement of professions and trades. Norman argues that changes in Scottish society in the 1740s also created Adam Smith the pioneer philosopher. The Union with England brought huge economic hardship on Scotland but "the Scots were ingenious both in finding new markets and in financing trade with them." Economic survival required imagination and sacrifice. Scotland became an economic laboratory for Smith. Adam Smith entered the University of Glasgow in 1737 at age 14 when it and "Glasgow were a glimpse of the future." The new environment at the university stressed the classics and religion but also mathematics and science. Smith entered that institution when "there was growing pressure for academic reform from civic fathers, merchants, and the increasingly prosperous and ambitious 'middling sort.'" They wanted "to open up university education while retaining its broader moral and religious beliefs." Its Professor of Moral Philosophy Frances Hutcheson "thought both more optimistic and more realistic at a time when the demands of commercial society were beginning to supersede the historic necessities of war." Hutchison would have a profound effect on Smith's thinking and powerful writing. Adam Smith did so well at the university that he earned what amounted to a scholarship to Balliol College at Oxford. He found it "Jacobite, Tory, factional, costly and Scotophobic," however. "We know very little about the six years he spent" there but Norman argues that Oxford gave him time to mature. He also obtained a broader education that contributed to his becoming a polished scholar, despite Balliol's many failings and high costs. Smith's professional rise began after his return to Scotland in 1746 and a series of lectures that he gave in Edinburgh. In those talks, Norman sees the developing ideas of systems "to find such order in chaos" as illustrated by the great astronomers. Adam Smith agreed with Sir Isaac Newton that "scientific theory is approximate, conditional, and future oriented," "that a theory can emerge as a coherent explanation" but "without the need to make grand assumptions about unknowable natural laws." Success in Edinburgh led to six years at the University of Glasgow as a professor, his Theory of Moral Sentiments, and all that came from it. His celebrity earned him a pension and later a government position that allowed him to study for the rest of his life. Norman points out, however, that Smith always gained from place and time. The failure of Scotland's Ayr bank, for example, helped to shape Smith's thoughts in The Wealth of Nations. Theory of Moral Sentiments "has labored in recent times in the shadows of The Wealth of Nations" but "it is a work of constructive theorizing." The author quotes Prime Minster Gordon Brown as describing Theory of Moral Sentiments as "underpinning" rather than in conflict with, The Wealth of Nations. Norman discusses these two works and Smith's never published "Lectures on Jurisprudence" to "tie together leading themes" "of the whole structure." Smith, for example, believed, that "systems do not succeed "by giving us knowledge of nature's laws" but "by resolving our doubts as much insofar as evidence allows." In that greater whole, Smith saw the system as a template for understanding culture, economics, and morality. Smith argued "what humans create—is itself a natural phenomenon" but "governed by human expectations, conventions, and norms." These ideas go far beyond economics in the modern world. One would think that a biography of an economist would make almost as dull a read as a book on economics. This volume tells a story well in an easy prose but while passively challenging the reader with deep ideas on almost every page. The author explains ideas in comprehendible form, encouraging thought rather than confusion. At times, the story has distractions but even then Norman quickly returns to his subject. So much of Adam Smith's life remains a mystery, even his exact date of birth. He must have, for example, had views on the "period of violent suppression of the Jacobites" following the battle of Culloden in 1746 but what? Remarkably, the reader seldom needs to turn to a dictionary to understand a word, much less a commentary. The book, minus its illustrations and annotations, also does not make for a particularly long text.